With the support of locals, and the help of twelve-year-old Robbie, a street urchin, and Janek, a Polish refugee dreaming of returning to his native land, the resourceful Maggie evades the first threats of closure from the Ministry. As she fights to keep her beloved Kitchen open, Maggie also tries desperately to reunite Robbie with his missing father, as well as manage her own family’s expectations. Ultimately, she can no longer ignore the unacknowledged hopes of her own heart, and the discovery that some secrets have the power to change everything. 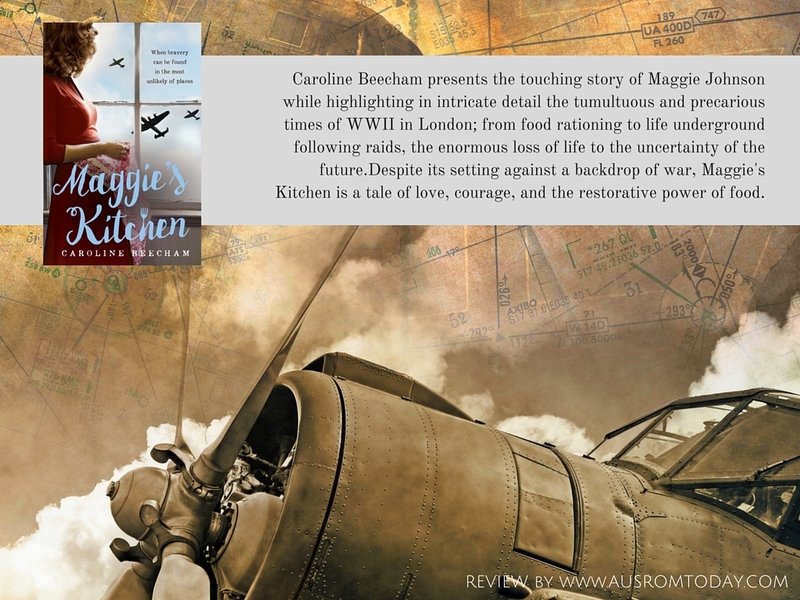 In Maggie’s Kitchen, Caroline Beecham presents the touching story of Maggie Johnson while highlighting in intricate detail the tumultuous and precarious times of WWII in London; from food rationing to life underground following raids, the enormous loss of life to the uncertainty of the future. In essence, Maggie is a helper, always putting others needs at a level of priority whether she knows them or not. It is this helping spirit that leads Maggie to respond to the government’s call for caterers to open restaurants to provide meals to the greater population thus also enabling Maggie to realise her own life-long dream of becoming a restaurateur. Secondary characters Robbie and Janek allowed for a broader understanding of how Londoners were impacted by the War and I’d have loved to have seen both characters explored in a little more detail as I felt both had compelling stories to tell. I loved that the chapter markers were excerpts from the Ministry of Food War Cookery Leaflets (and similar organisations) as it gave an authentic look and feel to the story, a glimpse back in time of sorts. Despite its setting against a backdrop of war, Maggie’s Kitchen is a tale of love, courage, and the restorative power of food. Maggie’s Kitchen sounds great, I can’t wait to read it.